Attach snapshots or game saves of Techs you want to be included in the Community Core stream. 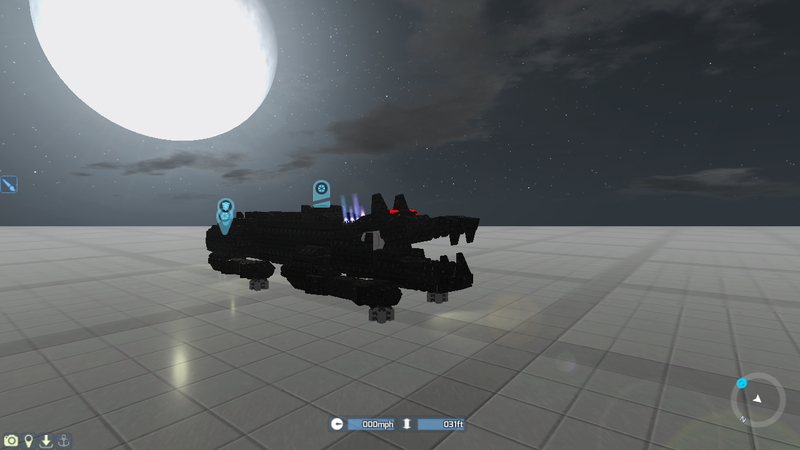 Community Core is a live stream where we showcase the best creations players have made in TerraTech. As we'll be streaming them on Halloween let's make them super scary! We want to see the spookiest techs you can come up with. Hoverbug controls, press X to extend the wings and deploy the landing gear, it will go up and down automatically as you near the ground. I didn't have anything spooky this week, hope this will suffice either way! There is new stuff that overrides most of this. Spam [Shift] to go up and hold [Shift] to go down . [W][A][D] to move in a stable altitude . It can craft all the parts , using GSO and Hawkeye compressed mineral . Also it has enough fire power to destroy enemies . As we'll be streaming them on Halloween let's make them super scary! We want to see the spookiest techs you can come up with. Maybe it should stipulate themed techs only...? I've left it a bit open-ended to give those want to show off other types of tech can. (1) Use Hammond Pumpkin Tank to defeat the Spoopy Ghosts. (2) Take Thomas to save Percy Pumpkin and vanquish the evil Witch Rats. Tip: Hold [Space] to enable movement. This is kinda thrown together around a couple of whimsical builds. A few technical issues stopped it being as spoopy as I'd initially intended, but hopefully still a little fun. Good luck! And now I'm going to build a skull car. LOAD R&D SAVE IN 1.0.0.6 OR ABOVE. SHIFT TO OPEN JAW, SWITCH TO AI CONTROLLED TAIL TO MOVE TAIL LEFT/RIGHT. In punishment for its endless gluttony, the sky goat was cursed to never set hoof on ground again. 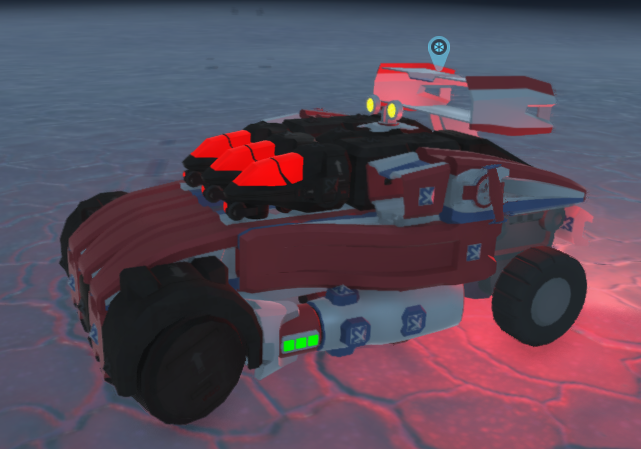 This car is (as far as I know...) the only one of its kind in the entirety of TerraTech's history. It uses the power of dichotomy to assume a driving style more similar to a real car, and as such drifts more like a real one too. The car is made of two sections, being the front and the rear. They are connected together thrice very solidly meaning only very rigorous twisting or Build Beam influenced movements are likely to dislodge them. The front section only has one pair of wheels, while the back has a pair of trailer wheels so as to not inhibit driving. Because only the front wheels are controlled, they are the only wheels that steer which allows the car to control more like a real one. The thing is decently nippy reaching speeds of 90mph without boost on flat ground and 110mph with boost. It is quite difficult to control so I have included detailed instructions on how to achieve its full driving potential. 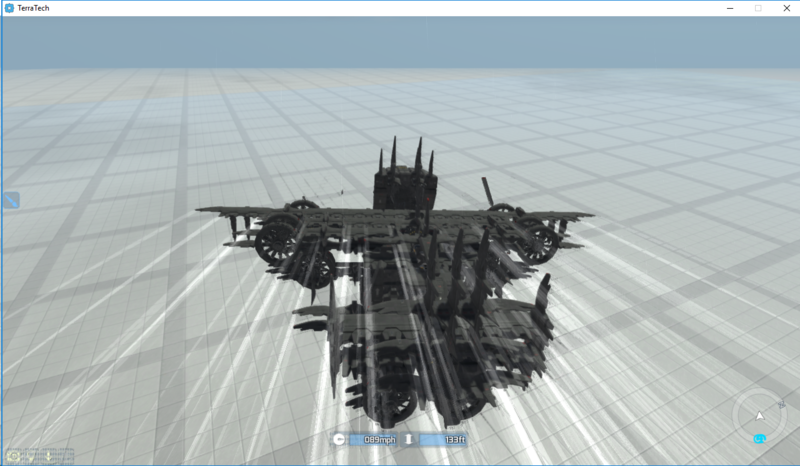 Due to the difficulty in assembling the vehicle, I have supplied both a pre-assembled Creative and RnD save. A, D = Steer left, right. UNDER NO CIRCUMSTANCES USE BUILD BEAM OR YOU WILL RIP YOUR TECH APART. Hold throttle, shift and steer in the desired direction. release the steering but continue holding shift to do a doughnut. Steering during doughnuts can somewhat influence your tech's radius of drift. Enter a wide doughnut and gently feather the steering in the direction of drift to reduce your radius of drift until you are almost spinning on the spot. (In RnD) set your rear to be an enemy and watch as you burn up in glory. 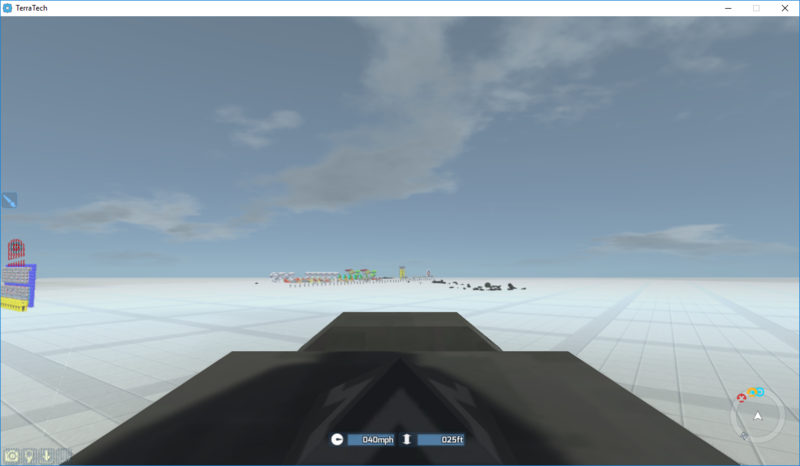 If having flipped completely: Reverse and allow the propellers to right you. 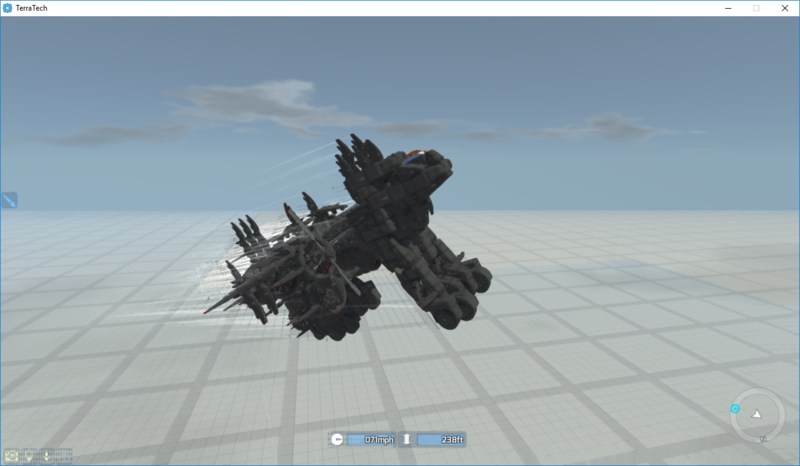 Else: manipulate your thrusters or propellers to completely flip yourself, then reverse. 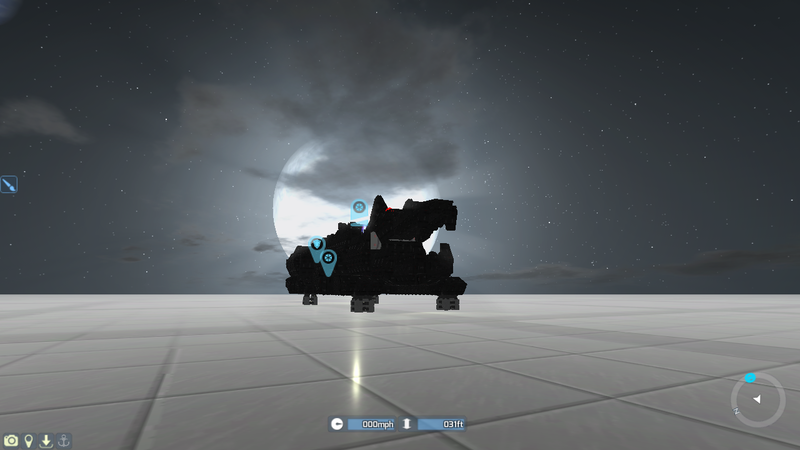 My first dog & large tech in TerraTech!